Background: The EQ-5D is one of the most used generic health-related quality-of-life (HRQOL) instruments worldwide. 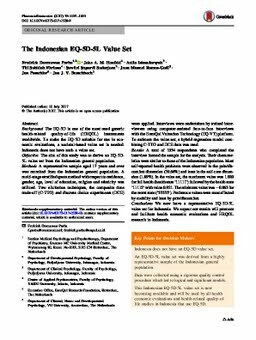 To make the EQ-5D suitable for use in economic evaluations, a societal-based value set is needed. Indonesia does not have such a value set. Objective: The aim of this study was to derive an EQ-5D-5L value set from the Indonesian general population. Methods: A representative sample aged 17 years and over was recruited from the Indonesian general population. A multi-stage stratified quota method with respect to residence, gender, age, level of education, religion and ethnicity was utilized. Two elicitation techniques, the composite time trade-off (C-TTO) and discrete choice experiments (DCE) were applied. Interviews were undertaken by trained interviewers using computer-assisted face-to-face interviews with the EuroQol Valuation Technology (EQ-VT) platform. To estimate the value set, a hybrid regression model combining C-TTO and DCE data was used. Results: A total of 1054 respondents who completed the interview formed the sample for the analysis. Their characteristics were similar to those of the Indonesian population. Most self-reported health problems were observed in the pain/discomfort dimension (39.66%) and least in the self-care dimension (1.89%). In the value set, the maximum value was 1.000 for full health (health state ‘11111’) followed by the health state ‘11112’ with value 0.921. The minimum value was −0.865 for the worst state (‘55555’). Preference values were most affected by mobility and least by pain/discomfort. Conclusions: We now have a representative EQ-5D-5L value set for Indonesia. We expect our results will promote and facilitate health economic evaluations and HRQOL research in Indonesia.